Happy last Friday of September! How the heck did it get here so fast?! In true Friday fashion, I have a handful of random outfit selfies to share with you. As with previous random roundups, I'm only linking to items that are still available, or have similar options already bookmarked. Even if you can't buy these exact pieces, I love sharing these combos with you for color and print pairing ideas! I hope you leave here inspired, that is my goal! Let's get started! These oversized plaid shirts from Express are definitely my go to when I'm feeling less than inspired. I've had all of mine for over a year now, but I consistently reach for them. They work well worn open as a makeshift cardigan when you're transitioning seasons, too! I remember waking up this morning with not a clue what to wear. This outfit combo is far from complicated, but sometimes I stare aimlessly into my closet room and am not sure if an outfit will jump out at me. 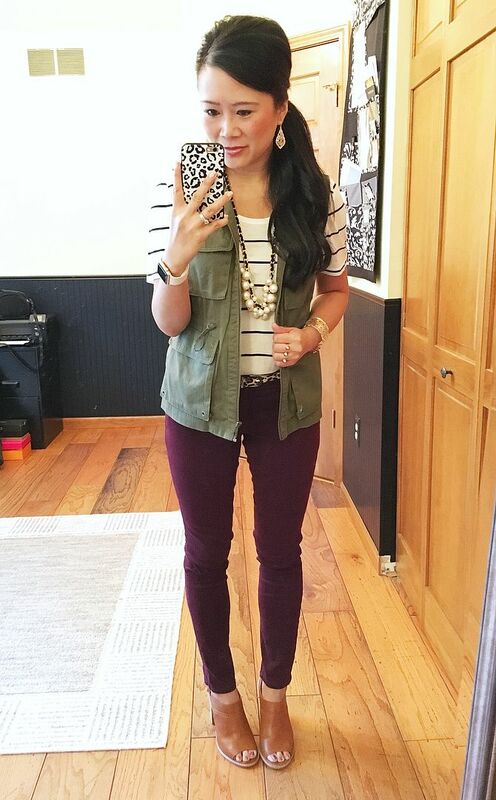 Now that the temps are cooling, my wine colored skinnies are going to be on repeat. 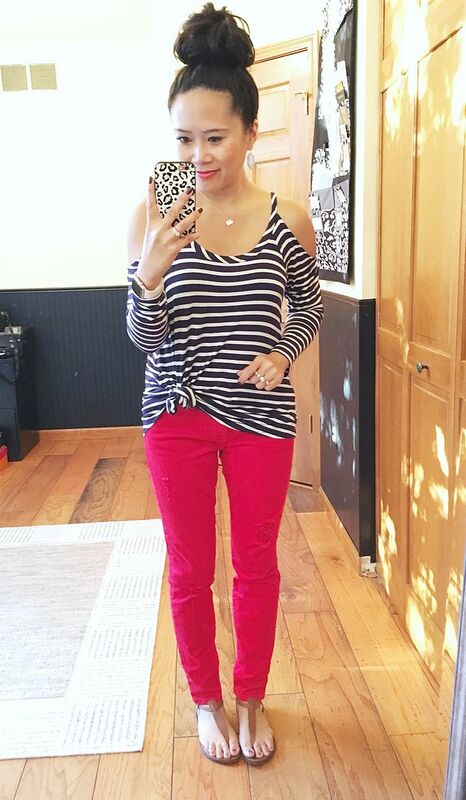 I started with them, pulled the striped tee, but then felt like it needed something else. The vest was the perfect finishing piece along with the necklace. All of a sudden, I had an outfit that I loved! Top: The Mint Julep Boutique (c/o) (limited sizes) | Bottoms: Current Elliott | Sandals: Sam Edelman "Gigi"
This top is also the perfect transitional piece. The cold shoulders keep it "summery" feeling, but the lightweight long sleeves are definitely necessary as the thermometer dips into the low 60s. I wore this for a late sushi dinner with the husband and just grabbed my Gigi sandals because they were easy. 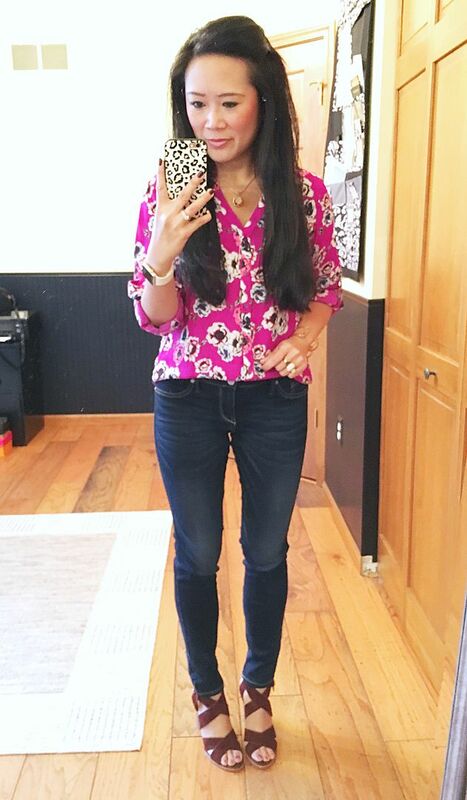 Top Express (loving this floral!) | Bottoms: Express | Shoes: Joie "Avery"
A printed portofino is also a good piece to have handy when you have no idea what to wear. 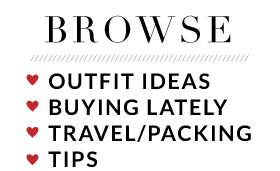 It instantly adds interest and anything + a portofino equals an outfit! The fit is pretty effortless, but a little bit more tailored than the oversized plaid shirts. This print really makes me happy! And last but not least! As part of my prerequisites to start my Pilates certification, we needed to have a certain amount of private classes taken. There are many times when I end up being the only person in class, but I had never scheduled an actual private appointment before. I found an instructor close to the office who had availability Tuesdays after work and first thing Friday mornings. Last Friday was one of my appointments with her and I wanted to make my outfit as easy as possible to transition from workout to work. Keep in mind that our office is pretty relaxed, so I use the term "work" loosely. In order to keep the base outfit feeling "sporty," I decided to wear my scoop neck tank backwards so you could see my bralette. 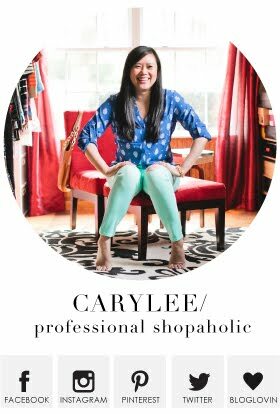 The chambray, necklace, and booties fake this outfit into being a real life one instead of a workout one. I was pleased with how this came out! And that's all I have for you today! Hope your week was great and your weekend is even better! Thanks for stopping by. 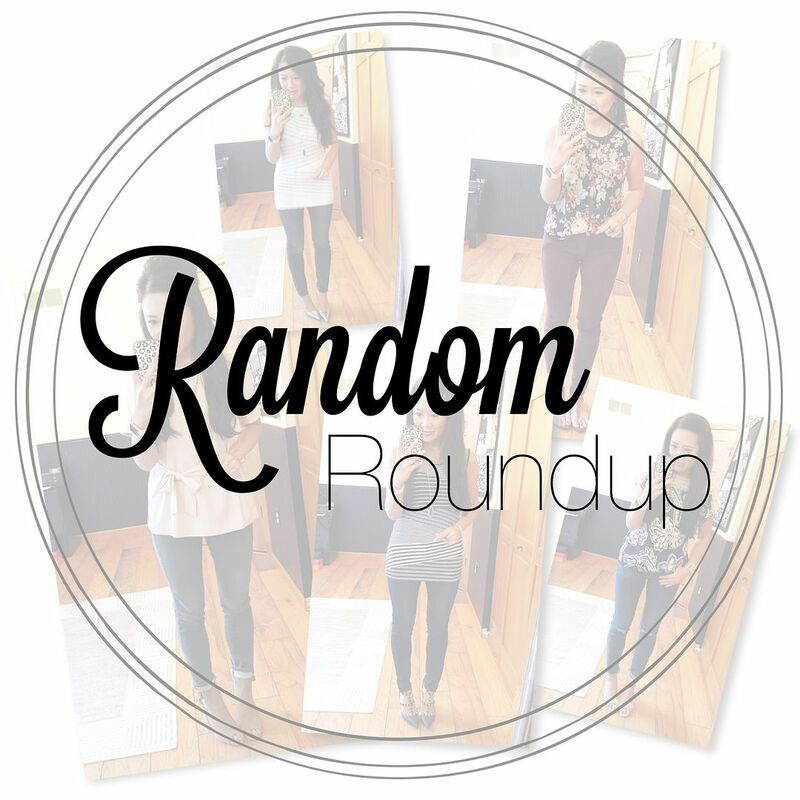 love this roundup, you always such cute combo and that last outfit from gym to work is genius. 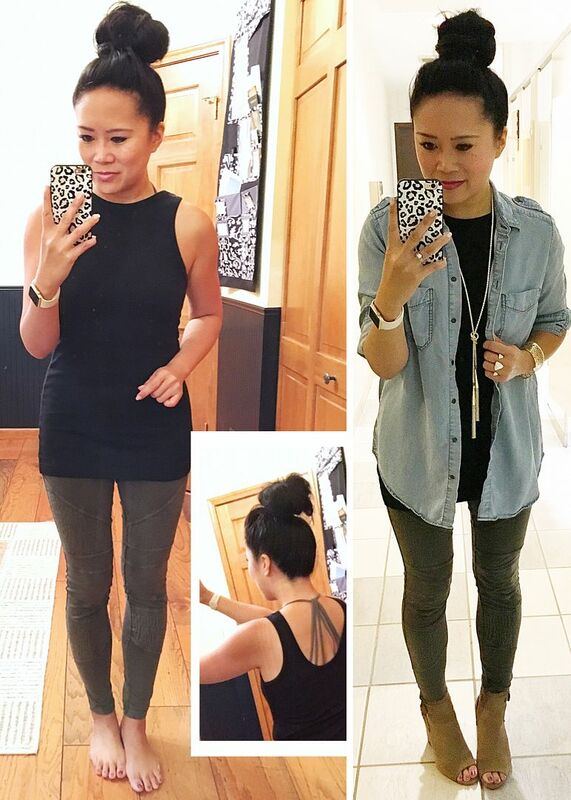 Amazed at how you were able to take that last outfit from work to Pilates! And darn I really wish they would make that oversized plaid shirt in a burgundy color again like the you have. Love that and sorry I missed out on it!